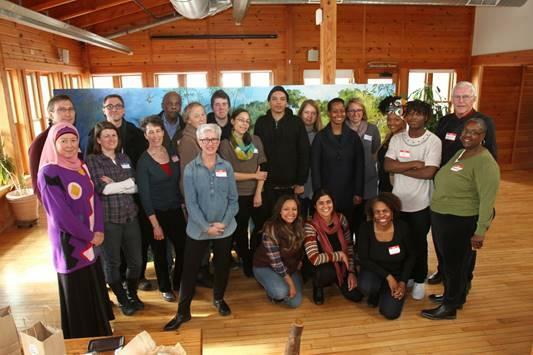 The water commons' Community Water Assembly. Milwaukee Water Commons was created four years ago to educate the community about water - its rivers, streams and Lake Michigan - to cultivate informed stewards. “I came from a more traditional environmental effort, which was the Milwaukee River Greenway Coalition – working to make the river more beautiful, more accessible. There was already a ton of passion around that issue, but it was by and large a middle class and white group of people,” founder Ann Brummitt says. So in 2013, Brummitt and a small team began holding meetings in a church basement off Fond du Lac Avenue in a primarily black neighborhood. Artist Melanie Ariens at the first Milwaukee Water Commons workshop. About two dozen people showed up to the first one. Brummitt was convinced more people needed to participate – especially if Milwaukee wants to be known as a leader in water science and technology. “We cannot leave two-thirds of our population out of the equation," she says. "I think it’s both the environmental degradation and also the missed opportunities if we don’t have everybody at the table being part of those conversations." The approach seems to be striking a local chord. More than 1,500 people have now joined in. Then last year, Brenda Coley joined the Commons. 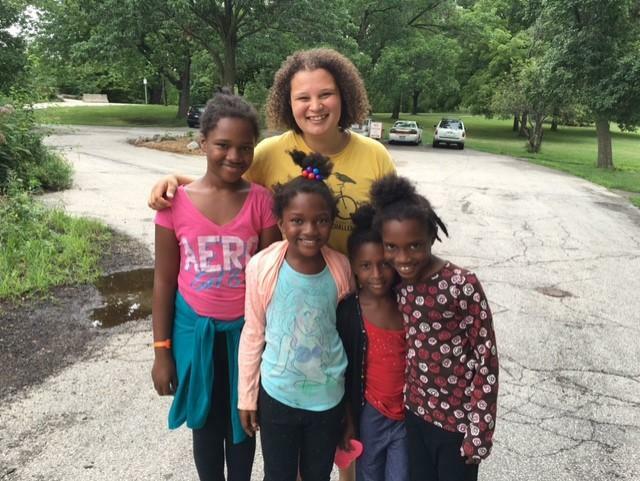 Her resume includes diversity training, but this was her first step into environmental issues. “You can’t say this on the radio,” Coley says. What 'you can’t say' is the word that popped into Coley’s mind when she and the Commons, and residents of the City of Milwaukee learned that its lead water pipes represent a public health threat to thousands of Milwaukee families, particularly children. Ann Brummitt and Brenda Coley co-direct Milwaukee Water Commons. “I had been there a couple weeks and I’m only hearing bad things, bad things, bad things. And I think I purposely ignored the environment. And I said to Ann, 'I thought you white people had this.' All I had to do was recycle and you don’t have even this and you’re into the environment. I don’t understand,” Coley says. Her tone might sound amusing, but she says the job of informing all the people who live in homes built prior to perhaps the 1960s that their drinking water may be dangerous is dead serious. Many of those residents are black and struggle to make ends meet. At the very least, Coley says, they need to install water filters; the ultimate solution is to replace the lead laterals running into the house. The Commons created a Community Water Assembly to push for solutions. Its 18 members represent the rainbow of diverse cultures that make up Milwaukee. Summer 2014, Core El Centro summer campers explore WATER. Coley says, beyond the weight of the lead challenge, Water Commons wants to help all Milwaukeeans to feel at home along the city’s waterways. “There is often a feeling for people who are different, for African-Americans in particular, when we go into traditional white spaces, feeling some not belonging. What are you doing here, you don’t belong here,” she says. Coley shares her own experience – walking her dog in Estabrook Park. “The black body is criminalized, so we’re always suspect. It doesn’t matter that I’m a 60 year old woman, I’m with a dog. Do you really think I’m going take your purse?” Coley asks. Co-director Ann Brummitt says some of her white peers are waking up. “There’s a responsibility on our side of the street to understand what is our part in this institutionalized racism, and these triggers that we have and how are we responsible and what can we do to change the equation, because it has been on people of color. So we have to pick up our bundle and start doing our work so the situation is changed, especially here in Milwaukee." Coley says Milwaukee Water Commons wants to transform outcry to action. But, "we can’t fix the problem because we didn’t break it. We can't fix racism, white people have to fix racism. They can learn from us, they can figure it out what to do. But they have to go into their own communities and do that work. And I often feel that means they have to heal from racism and that’s what African-Americans and other people of color can do, we can help white people heal from racism, so they can do the work that they need to do in order to get this society back on track." Coley and Brummitt insist Milwaukee cannot afford to delay fighting racism, any more than it can put off replacing the lead pipes that threaten the health of thousands of residents. For more on this topic, explore our Project Milwaukee: Segregation Matters series. Have a question about segregation? Submit your queries below. Milwaukee native Davita Flowers-Shanklin brings a unique experience to the discussion of segregation, and its ripple effects. “I remember being in high school and being really into science and biology. I was the co-director of Camp Everytown, which is a diversity camp for teenagers," Flowers-Shanklin says. "So my work even as a teenager was around anti-oppression." Segregation impacts many different areas of our lives in metro Milwaukee. One that may not be top of mind is its connection to environmental health and justice. WUWM found an intricate tapestry of challenge and hope -- starting with Antoine Carter. His childhood started on East Chambers in Milwaukee. “I remember drugs and gangs and outdoor football and people getting jumped and all sorts of stuff. Just living in this area in the 1990s, I was a little too young to understand everything that was going on, but I still could see that things weren’t right,” Carter says. Segregation comes with borders, whether they are manmade - 124th Street, the dividing line between Milwaukee and Waukesha counties, or natural - the Milwaukee River. Today, WUWM reports on one particular border, and how some people feel about crossing it. 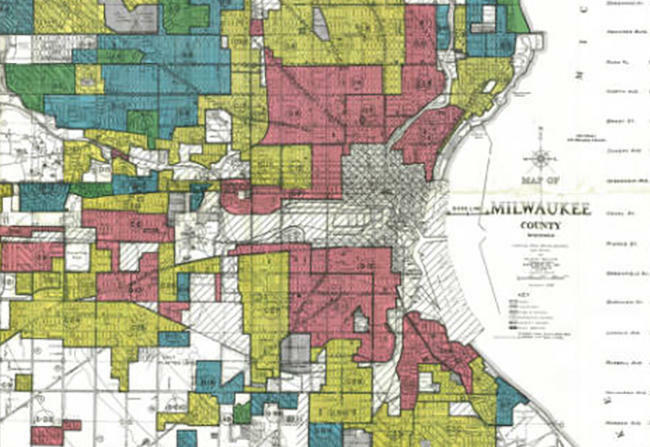 How Did Metro Milwaukee Become So Segregated? “Segregation is not an accident,” according to Reggie Jackson, the head griot for America's Black Holocaust Museum.